Model reduction or model order reduction is a mathematical theory to find a low-dimensional approximation for a system of ordinary differential equations (ODEs). 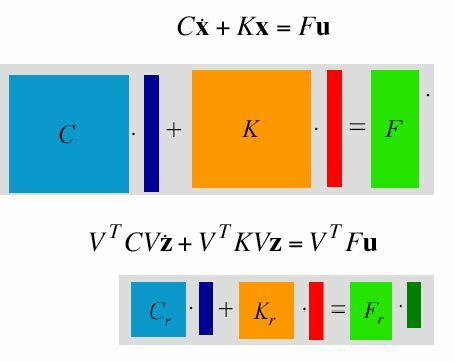 The main idea is that a high-dimensional state vector is actually belongs to a low-dimensional subspace as shown in Fig. 1. Fig. 1. Idea of a low-dimensional subspace. Provided that the low-dimensional subspace is known, the ordinary differential equations can be probjected on it. This is showin in Fig. 2 in the case of a linear system of ODEs. The projection gives us a required low-dimensional approximation. Fig. 2. Projection a system of ODEs on to a low-dimensional subspace. The goal of the mathematical theory is to find such a low-dimensional subspace. Available methods for model reduction are classified as follows. Page Linear describes model reduction for a linear system of ODEs of the first order. 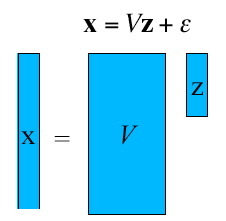 Page Second Order describes model reduction for a linear system of ODEs of the second order. Page Parametric describes model reduction for a linear system of ODEs when it is necessary to preserve some parameters within system matrices. Page Weakly Nonlinear describes model reduction for a nonlinear system of ODEs but when nonlinearity is limited to quadratic and cubic terms. Page Nonlinear describes model reduction for a general nonlinear system of ODEs. MOR Home will bring you to this page at any time. Note that model reduction is an active area of research and not everything is presented at this site. Dimension Reduction of Large-Scale Systems. Benner, P., Mehrmann, V., Sorensen, D. (eds). Special Issue on Order Reduction of Large-Scale Systems. Peter Benner, Roland W. Freund, Danny C. Sorensen and Andras Varga (eds). My e-mail is erudnyi at cadfem point de. Phone is +49 8092 7005 82.